Sophie loves food? Check. Sophie loves wine? Also check. 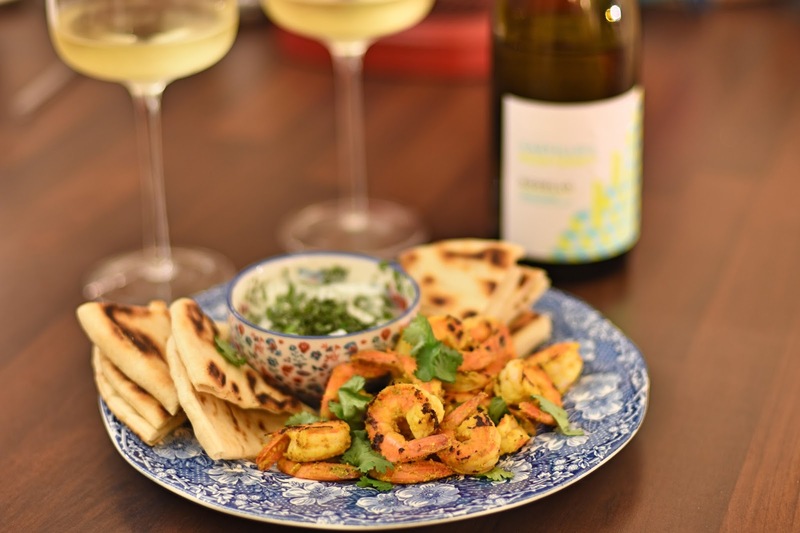 I was thrilled when Marks and Spencer invited me to an evening of regional food and wine pairing a few weeks ago for their wines of the world campaign. I would say that I'm pretty talented at pairing food and wine together, as in I drink wine with my food a lot and absolutely I love it! But jokes aside, it was super interesting to learn about different wine regions and exactly why certain wines go with certain foods. The evening pretty much felt like being on a jet set world tour with a heap of wines from England, France, Spain, Argentina and South Africa all made especially for M&S. It almost felt like speed dating. The aim of the game was to pick a favourite and pair it with our own dishes at home testing out our newly polished food pairing skills. Starting off in England with the Marksman English Sparkling Brut Blanc de Blancs 2011, we learnt the difference between sparking wine and prosecco. Prosecco is made in big vats and can be on sale from as little as 12 months after grapes are picked. Sparkling wines like the Marksman are fermented for much longer in individual bottles with yeast and sugar. This traditional method helps to give a super toastiness and really fine bubbles which feel almost like a mousse on the tongue. Retailing at £26 a bottle, this is definitely more of a festive treat but certainly one I'm looking forward to with breakfast on Christmas day this year. Its truly the perfect match for smoked salmon or seafood canapés as the acidity and bubbles will blend perfectly together. Moving onto France and another favourite of mine the Florent Rouve Viré-Cléssé 2014, a Chardonnay produced in the Burgundy region. Its crisp, citrus and mineral taste are the perfect balance to cut through the salt and fat of dishes with chicken or cold meats like Serrano ham. I'm not usually one for Chardonnay, but with a generous helping of ham I was definitely swayed by the peach flavour. I've definitely learnt that I can enjoy this type of grape with the right meal. Next up, South Africa and the Paul Cluver Late Harvest Riesling 2014. Although I may have a super sweet tooth, I'm not usually one for super sweet wines like a Riesling. But hear me out as M&S have converted me with a humble slice of mature cheddar alone. This late harvest grape introduces some fungus into the mix from something called noble rot. This helps to shrivel the grapes up and increases the intensity of sugars. The result is a golden honeyed flavour as the yeast in the wine making process can't ferment all of the sugars. Its surprisingly fresh and not cloying. From here on my ultimate indulgent Friday night's home alone will involve me consuming blocks of mature cheese with this stuff. Umami here I come. 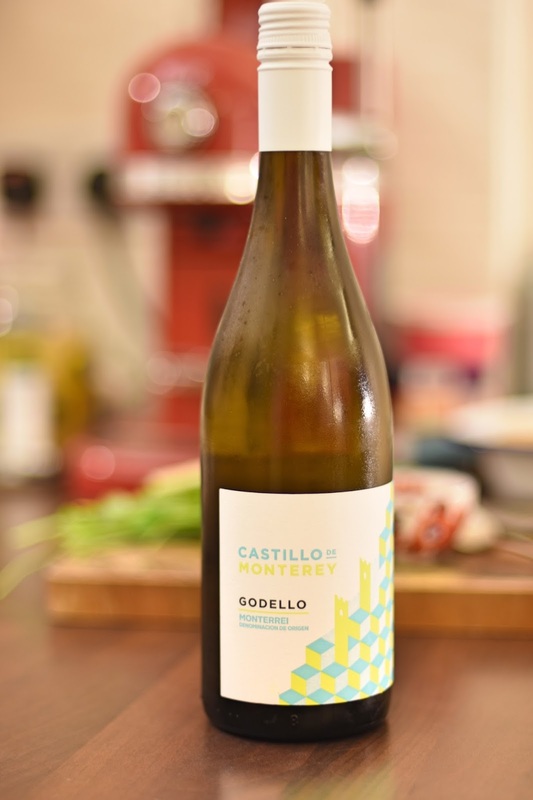 And my absolute favourite, Castillo de Monterey Godello 2015 from Spain. Of all the glasses laid out in front of me on the table I found myself keep going back to glass 'number 6', one of the cheapest of bottles from the evening at £9.50. This zingy, fresh and light wine is perfect to cut through oil and saltiness in a variety of different dishes like seafood and cold meats. I've been really getting into prawns recently so decided the ultimate match would be some spicy prawns. 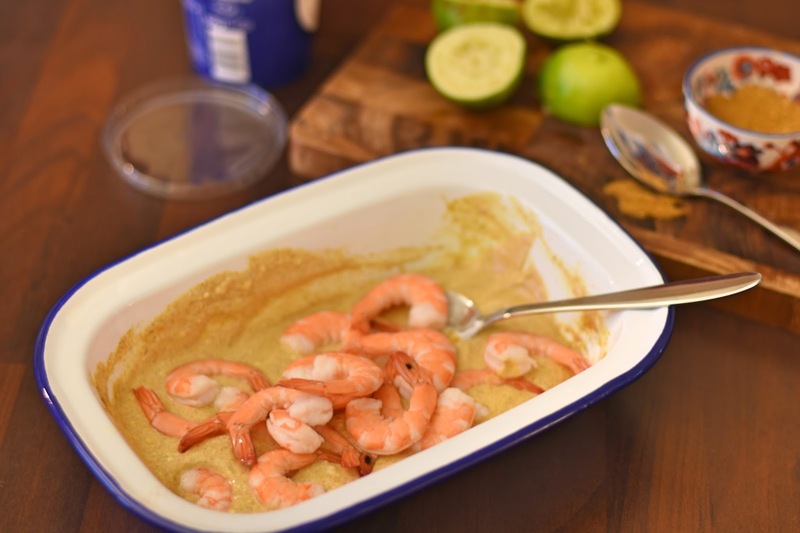 A super speedy side or starter, these prawns can be marinated in advance ahead of a dinner party and presented on a nice platter. Although I'm not one for frills, so I threw these together on the weekend for a late lunch because it's excusable to drink wine with lunch on the weekend! I loved just how much the citrus of the wine cut through any oiliness of the prawns. 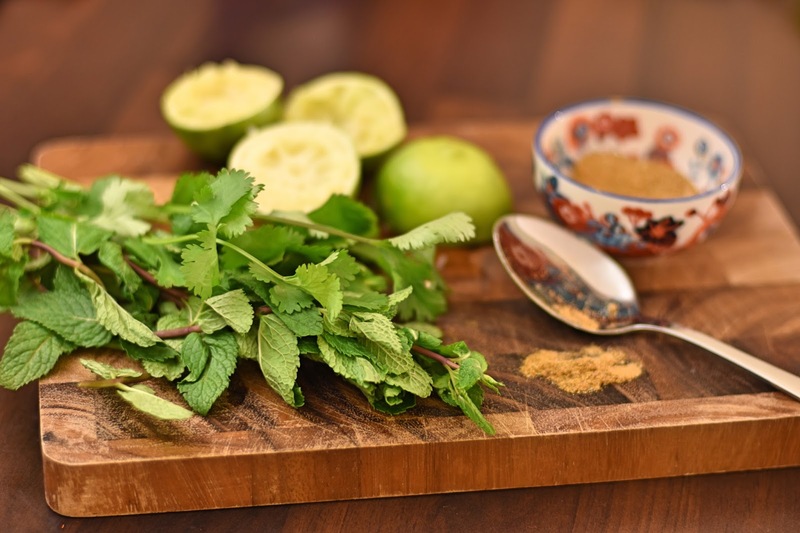 As spice tends to make alcohol taste hotter the mint yogurt dip is the perfect accompaniment. And, marinating included, can be knocked up in under 30 minutes. In a small mixing bowl, add the tandoori mix, yogurt and lime. Mix well and season. Remove the prawn shells and devein, leaving just the tails. Marinate the prawns in the spice mix in a large shallow dish for 10-15 minutes. Heat a large griddle pan with a little oil and gently toast the flat breads until a little golden on each side. Wrap in tin foil to keep warm and set aside. Add the prawns to the griddle pan and grill for 6-8 minutes ensuring to turn and brown each side. 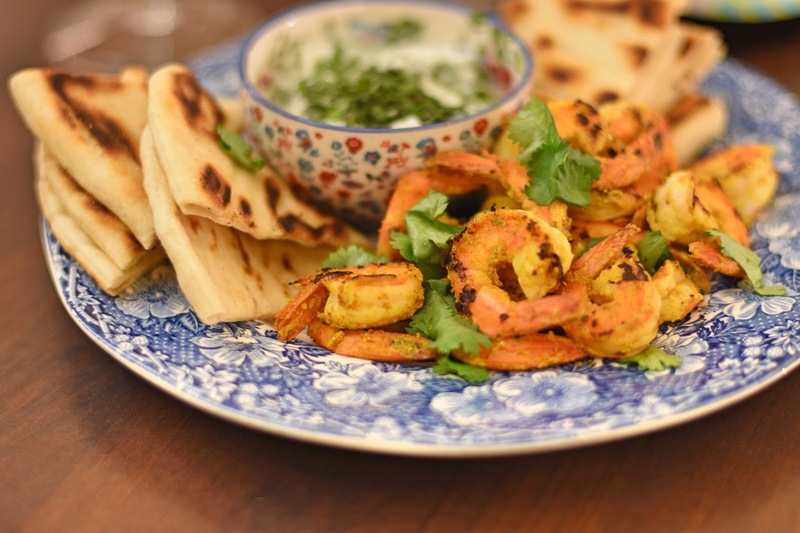 Serve the prawns hot with the flatbreads dunked in the yogurt topped with mint and coriander. And so for future wine pairing endeavours, I will ensure to match fruity with meats and fish and sweeter wines with lots and lots of cheese! For more info and pairings, visit the Marks and Spencer International Wine Guide here. Thank you Marks and Spencer for having me and for sponsoring this post. I've learnt loads and can't wait to try some new food and wine pairings!